Posted by Dave Emory ⋅ October 31, 2018Post a comment Email This Post Print This Post Tweet This! COMMENT: With the New Cold War gathering momentum and Trump’s withdrawal from the treaty on intermediate range nuclear missiles pointing the world toward war, it is worth reflecting on the history and deep politics that brought this about. Colonel L. Fletcher Prouty has written about events in August of 1944 that are indicative of the coalescence of the “Christian West” concept that we discussed in AFA #37 and further developed in FTR #1009. We note that it was in August of 1944 that the famous “Red House” meeting at which the Bormann flight capital network realized under the auspices of Aktion Adlerflug was launched. 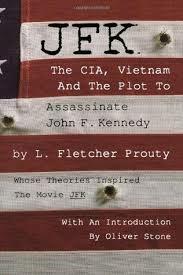 JFK: The CIA, Vietnam, and the Plot to Assassinate John F. Kennedy by Col. [Ret.] L. Fletcher Prouty; Skyhorse Publishing [HC]; Copyright 2011 by L. Fletcher Prouty; ISBN 978-1-51073-876-8; pp. 10-11. However, even before the surrender of Germany and Japan, we began to hear the first rumblings of the Cold War. The Office of Strategic Services, and particularly its agents Frank Wisner and Allen W. Dulles in Zurich, nurtured the idea that the time had come to rejoin selected Nazi power centers in order to split the Western alliance from the Soviet Union. “Rejoin” is the proper word in this case. It was the Dulles-affiliated New York law firm of Sullivan & Cromwell that had refused to close its offices in Nazi Germany after the start of WWII in 1939, even while Great Britain and France were locked in a losing struggle with Hitler’s invading forces. Therefore, the Dulles OSS “intelligence contacts” in Nazi Germany during the war were for the most part German business associates with whom he was acquainted. On August 23, 1944, the Romanians accepted Soviet surrender terms and in Bucharest the OSS rounded up Nazi intelligence experts and their voluminous Eastern European intelligence files and concealed among a trainload of American POW’s who were being quickly evacuated from the Balkans via Turkey. Once in ‘neutral” Turkey, the train continued to a planned destination at a site on the Syrian border, where it was stopped to permit the transfer of Nazis and POW’s to a fleet of U.S. [Army] Air Force planes for a flight to Cairo. I was the chief pilot of that flight of some thirty aircraft and was stunned by the discovery of two things I would never have suspected: A number of the Americans had had one or both legs amputated at the knee by their Balkan captors, solely for the purpose of keeping them immobile (the plane I flew had airline seats rather than canvas “bucket” seats, and the men on my plane had lost one or two legs in that barbaric manner), and concealed among these POW’s were a number of Balkan Nazi intelligence specialists who were being taken out of the Balkans ahead of the Soviet armies by the OSS. As far as I know, this was one of the first visible clues to the emergence of the “East-West” Cold War structure, even while we and the Russians were still allies and remained partners in the great struggle against the Germans. It was this covert faction within the OSS, coordinated with a similar British intelligence faction, and its policies that encouraged chosen Nazis to conceive of the divisive “Iron Curtain” concept to drive a wedge in the alliance with the Soviet Union as early as 1944–to save their own necks, to salvage certain power centers and their wealth, and to stir up resentment against the Russians, even at the time of their greatest military triumph. I was only a pilot on that flight, and in no way involved in the diplomatic intricacies of that era, but I have always wondered whose decision it had been, back in mid-1944, a year before the end of World War II, to override the present alliances and to initiate a split between the West and our wartime partner the Soviet Union while we were still firm allies. . . . .